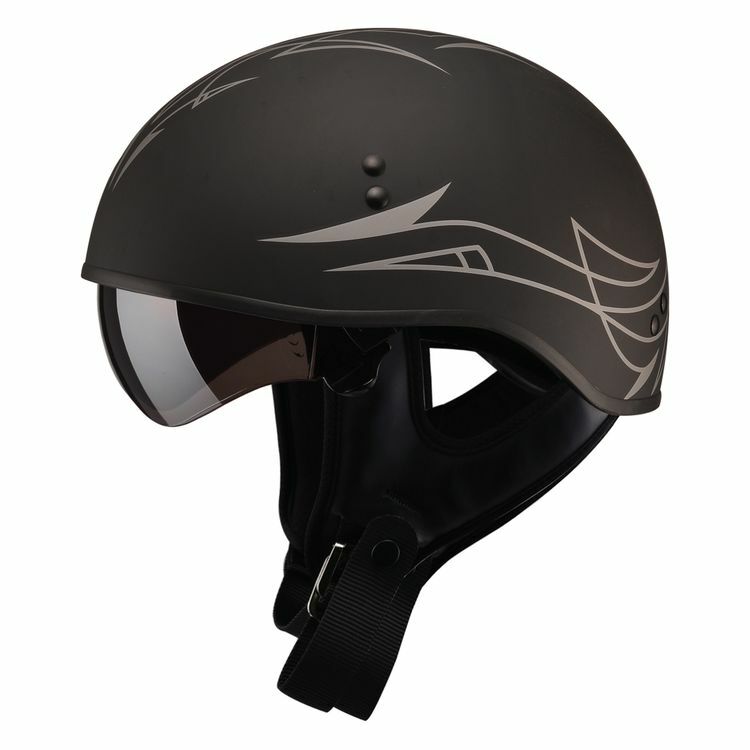 The GMax GM65 Naked Half Helmet is full of design features that include a tool-less quick change sun shield system and a dual density EPS that allows for a lightweight small shell design. The sun shield is UV400 rated for 100% UV protection. I wear glasses but when I ride during the day I can get away with riding with my motorcycle sunglasses but dusk into night time I can not see past 3 feet in front of me. I’ve tried over the glasses goggles which just dig into my nose. I did not know if helmets with built in visors would work so I visited every motorcycle stores in my area trying on different makers till I tried the GMax gm-65. Found the fit is a little bigger on me because the helmet is a long oval so I went down one size for a perfect fit. The visor cleared my glasses with no problem and comes down very close to my nose but does not touch, the visor does not distort my vision either. Riding on the streets I did not have any issues with the wind that comes up from under the visor, I could see if your glasses frame was thin there would be a lot more wind but my frames a thicker more stable shape. On the highway I did have I little more wind (as aspected) coming up under my glasses but it was not so bad that I needed to change over to the motorcycle glasses. Changing the visor could be a little tough,my larger fingers I just could not get the tab pushed down enough to release the visor, very happy that a second visor, clear was included, looking forward to riding at night. The over all look sealed the deal, I ride a 2018 Indian Chieftain Dark Horse so the matte finish of the helmet matches the bike’s matte black paint (the silver gray pin strip would look great on the bike too) I know everyone has different experience with the helmet but for me I love it.